Phoenix, Ariz. – Camelot Homes has released a new floorplan at Lane’s End, its “downsized luxury” new community in North Scottsdale with a walking path to Desert Canyon Elementary and Middle Schools, the McDowell Mountain Ranch Park and Aquatic Center and Arabian Library. Lane’s End, a gated community, has floorplans ranging from 3,100 to 3,800 square feet. The new floorplan is targeted for luxury buyers who are considering communities such as Camelot Homes’ top-selling White Horse, a new luxury gated community with homes from 4,000-6,000 square feet near DC Ranch, but want less square footage. New floorplan 5524 offers verandas with indoor and outdoor living from the front yard, giving specific homes ideal views of the McDowell Mountains. 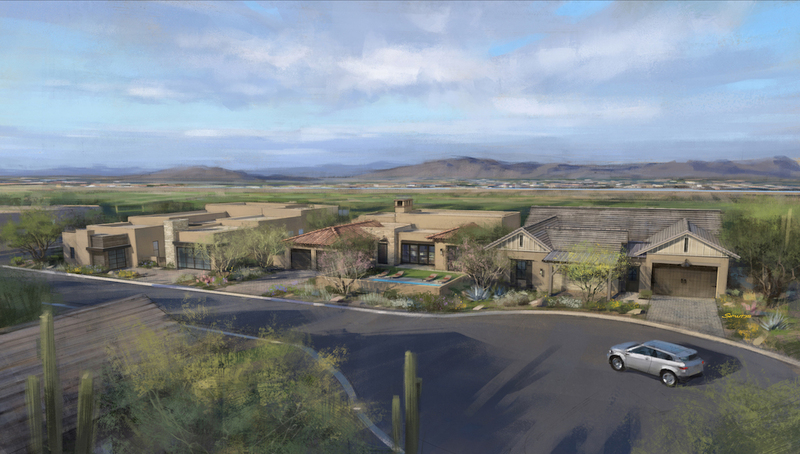 Fifteen homes are located on 10,000 square-foot lots, with half of the lots backing up to the McDowell Mountain Golf Club. The homes are priced from the high $900,000s. Some of Lane’s Ends facades are similar to White Horse. White Horse is more than half sold since its grand opening in February and has drawn 1,000 potential buyers on weekends. White Horse recently won Best Detached Product Design for its price point at the Home Builders Association of Central Arizona’s 2018 MAME Awards. White Horse also recently earned PCBC’s Gold Nugget Merit Award honors for Best Single Family Detached Home 3,500-4,500 square feet (Cheval floorplan), Best Single Family Detached Home over 4,500 square feet (Cavallo floorplan), and Best Indoor/Outdoor Lifestyle for a Home (Cavallo and also Equus floorplans). Sales for Lane’s End are currently taking place out of the White Horse community. Camelot Homes is one of the oldest, family-owned homebuilders in Arizona. With more than 45 years’ experience building thousands of homes in Arizona’s finest communities, Camelot Homes has established an unparalleled tradition of home-building pride and excellence. Three generations of the Hancock family have guided Camelot’s growth over the years. From its inception in the 1960s by Maggi and J.W. Hancock to today’s second and third generation of leadership by Mark and Julie Hancock and Cammie Hancock Beckert, the family continues to carry out the company’s formula for success: a dedication to the customer—with an uncompromising emphasis on unique architectural design, details and quality workmanship. Learn more at camelothomes.com.